Slap shot hockey | JumpyKing.com Bradenton FL. 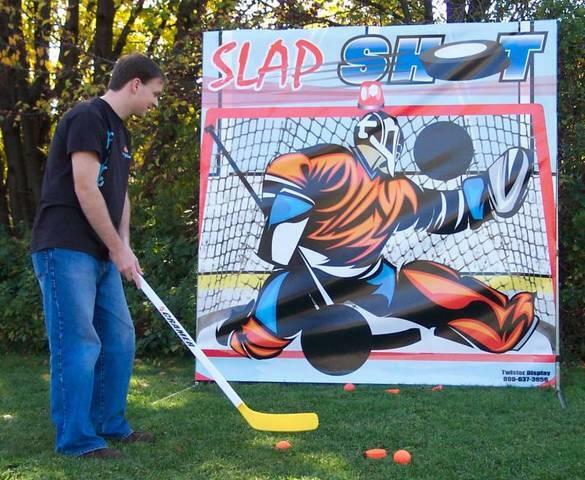 Slap Shot Hockey is a winner at any sporting event, fund raiser or carnival. It's a very simple game, but irresistible! Hockey players from the little tikes to the big boys will be lining up to give it a shot. And you'll be impressed by the profit potential of this compact, low maintenance, low cost unit. Like all of our games, Slap Shot Hockey can be set up in less than five minutes and can be used indoors and out.